InDesign Server installations can be used for handling background tasks for Enterprise Server such as generating previews for articles and layouts. Multiple InDesign Servers can be defined in Enterprise Server, and any tasks that need to be performed (referred to as 'Jobs') can be distributed across these instances as needed. When multiple InDesign Server instances exist, each instance can be set up to only handle Jobs of a specific priority (see About InDesign Server Jobs). All Jobs have a default priority assigned but this can be manually overruled when needed. Each InDesign Server instance that Enterprise Server needs to be able to make use of needs to be defined in Enterprise Server. The process of generating layout previews requires the same version of InDesign Server to be defined in Enterprise Server as the version of InDesign with which the layout was created. When this is not the case, no preview is generated for the layout. This means that even with a correctly configured system, it may occur that no layout previews are generated. As an alternative method, InDesign can be used for generating the layout previews. However, this can be a time consuming process and may affect the waiting time for an end user. For more information about delegating processing tasks to InDesign or to InDesign Server, see Setting up InDesign Server Automation in Enterprise Server 9. Step 1. 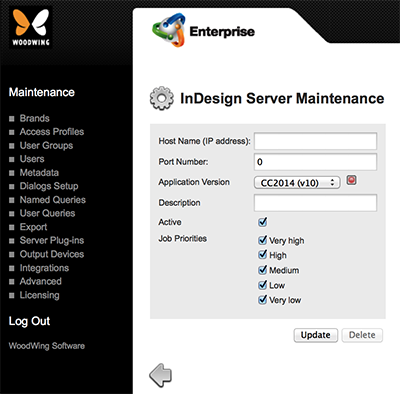 In Enterprise Server, access the Overview of InDesign Servers page. Step 1a. Click Integrations in the Maintenance menu or on the Home page. Step 2a. In the InDesign Server Jobs section, click InDesign Servers. The Overview of InDesign Servers page appears. Step 2. Click New InDesign Server. The InDesign Server Maintenance page appears. Figure: The InDesign Server Maintenance page. Host Name (IP address). Defines the address on which the SOAP interface of InDesign Server is available. Note: This is an http address; enter either the host’s IP address or its DNS name. Port Number. The port on which InDesign Server is started. Application Version. The version of InDesign Server. Tip: Click the Auto Detect Version button (  ) to automatically detect the installed version. Description. (Optional) A short description. Active. For enabling or (temporarily) disabling the instance of InDesign Server. Job Priorities. (Requires Enterprise Server 9.6.0 or higher). Select the check boxes for the Job Priorities that the server instance needs to process, and clear the check boxes for the Job Priorities that it should not process. The Overview of InDesign Servers page appears with the newly created InDesign Server instance added to the list. Example: The job type for the preview operations of the Multi-Channel Text Editor in Content Station is named 'WEB_EDITOR' and has a default prioritization of "2" (high). To lower it to "3" (medium) use 'WEB_EDITOR' => 3.